An iPhone application to track and share your feelings. Version 1.0 was published Jan 25, 2011. Version 1.2 was published May 10, 2011, and included an ability to record who you were with and what you were doing when you logged a feeling. New illustrations and coaching pages were also added. Version 1.3 was published August 2, 2011, and included an advanced reports feature along with the ability to export data to email. Version 1.4 was published August 15, 2011, and included settings changes. Version 1.5 was published Mar 12, 2012, and included a bug fix and added FAQs. Version 1.6 was published Nov 19, 2012, and included notes - a way to record your thoughts when you logged a feeling. Version 2.0 was published May 23, 2013, for iPhone 5 and changed the app to a paid download instead of an in-app purchase. I didn't have time to update the app for iOs11 and removed it from sale on Octobter 10, 2017. Self-awareness starts with understanding what you feel – your emotions, also known to scientists as “automatic affective reactions”. Not surprisingly, given the cultural discomfort with feelings in the U.S., many people have difficulty answering the question, “How do you feel?”. The objectives of the application were as follows. The application was available on the iPhone, iTouch, and iPad and in English and Spanish. Ultimately, tracking emotions should help users to understand what they feel and why they feel that way. The majority of users were in the U.S. Many users wanted words that described sensations as opposed to emotions - like "tired"
In the last half of 2010, 12 feelings-related apps (not counting the hard-core mental health ones) were released on the iTunes store. Most utilized smiley icons or asked the question, "How happy are you?" as opposed to "How do you feel?" 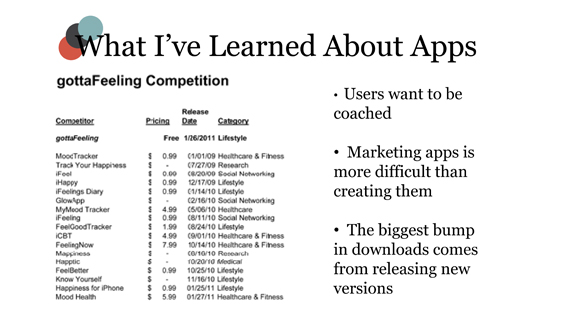 Most of these apps were paid. Since then, of course, the market has exploded. The gottaFeeling app was the first to do an in-app purchase in the segment and people paid for advanced reports (a one-time fee of $1.99). Interestingly, UK users were responsible for the majority of gottaFeeling's in-app purchases. In 2013, I switched to pay for download and priced the app at $2.99. We can get emotions data via self-reporting through an application like gottaFeeling, but we can also get emotions data via unstructured content using sentiment analysis. Sentiment analysis, derided for its earlier incarnations, is making new headway. There are a number of companies offering it or using it today. In fact, wherever there is text, sentiment analysis can get at the underlying emotions. Blogs, tweets, Facebook posts, etc. can be used to gauge public emotions. And particularly when it comes to text found on social media, the networks of users can add to the emotional profile of any one user. It's even being done over the phone. So why use self-reported data? Because sentiment analysis has its downsides. While audio gives another element with which to do better analysis, text alone has problems. There are idioms and expressions that algorithms miss and sarcasm is still difficult to detect. There's also the issue of punctuation as communication (e.g., a series of exclamation points in a tweet), clarity of the sentiment object, how much analysis is automated versus manually interpreted, and perhaps the largest issue is the problem of context, or lack thereof. Which all points to accuracy. So there's still a lot to do, but even in its current state, emotional analysis spells profit for businesses. Emotions data give marketers clues to whether their messages resonate, and emotions are predictive - of behavior and other emotions. Data gives us a foundation to make predictions and big business wants to understand what you will do next. Purchase histories are already used by companies. A good example of this is how Visa used credit card transactions to predict divorce (apparently they can predict divorce up to two years before a couple actually divorces). Why do they want to know? Because those going through divorce are more likely to miss credit card payments. Today, tweets about movies can be used to predict the opening day results of films. The sentiment of tweets can even predict stock market movement (see a study by Johan Bollan, et al out of Indiana University). When his team tried predicting whether the stock market would go up or down, first using only the Dow Jones Industrial Average from the past three days, they achieved 73.3% accuracy but when they added emotional information they achieved 86.7% accuracy. Another interesting note is the work of Jennifer Lerner who found that even incidental emotions can influence decisions when real money is at stake. In fact, emotions data can even predict future emotions. There is software now that customer service operations use to understand a caller's emotions and even suggest tactics the rep should take given the customer's emotion. In real-time. Some even say they can predict when a customer will begin to yell up to one minute before the customer begins yelling. Artificial Intelligence can take this initial mapping and prediction even further. The most important take-away from gottaFeeling: Data is not information. Users consistently asked for more coaching and ways to interpret their feelings data. More research is needed to determine if tracking one’s feelings makes an appreciable difference in one’s life satisfaction or behaviors, but in the meantime, I learned a lot.